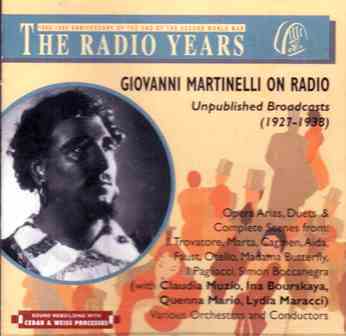 Giovanni Martinelli is for me the greatest tenor of the recorded era: what I wouldn’t give to have heard live his performances of Otello or Il Trovatore. Luckily he was quite well recorded, albeit not always in the best quality (his best recordings were made between about 1915 and 1941 so that is not so surprising), but they do none-the-less capture the excitement and quality of the voice. 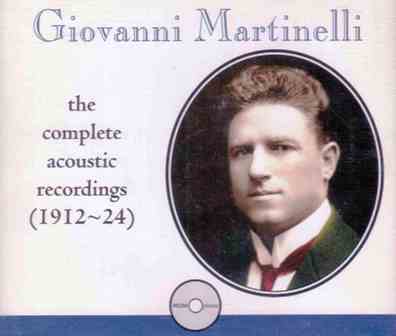 A short biography of Martinelli can be found here, Biography, whilst reviews and opinions about him can be found below. 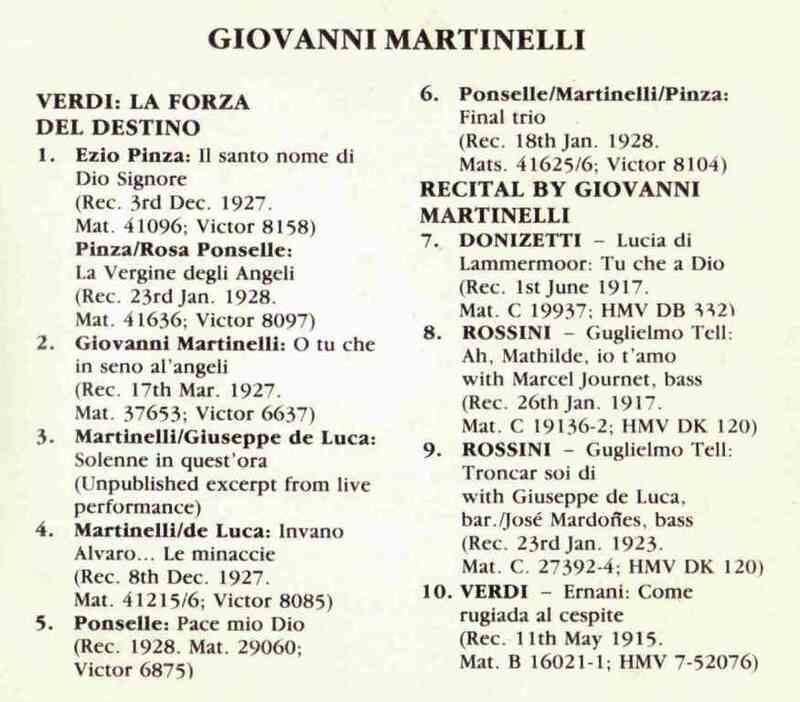 In this section I will look what has been written about Martinelli, including reviews of his performances, retrospective appraisals of his singing, and I will look at the records and CDs that are available now for Giovanni Martinelli and where possible also look at the reviews and reaction to these releases. Martinelli's reportory which I have taken from this website (now requires authorisation). Reference: The Record Collector, Volume 25, Nos. 7/8/9, October 1979. 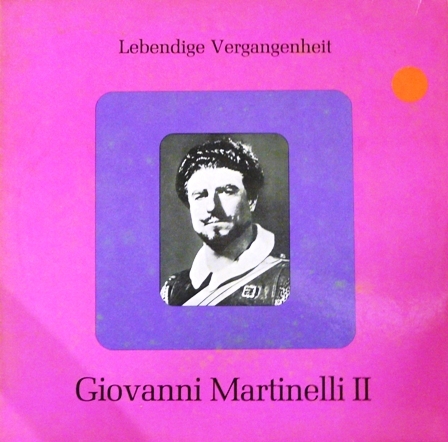 Giovanni Martinelli, The British Institute of Recorded Sound, May 1962 . 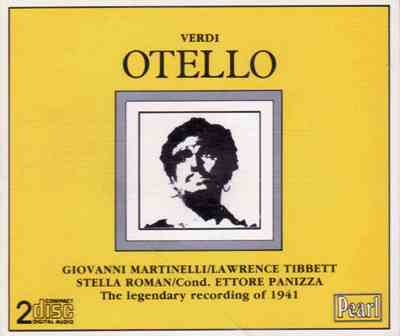 Let's start with the CD that first introduced me to that great tenor, the 1941 Otello recording. This recording is released by Pearl, GEMM 267-9 and features, with Martinelli, Lawrence Tibbett as Iago, Stella Roman as Desdemona and Alessio de Paolis as Cassio, and the performance is live from the Metropolitan, on the 4th December 1941, conducted by Ettore Panizza. 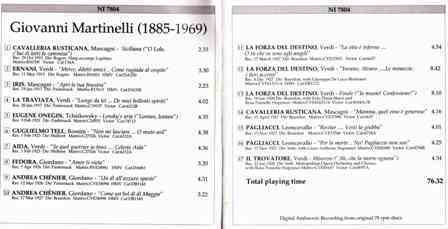 A second release of a live Metropolitan Otello followed from Music and Arts, CD645. 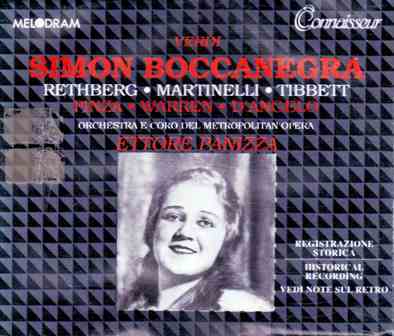 This performance of 12th February 1938, offers better sound, with the continued benefits of Tibbett and Panizza and also with the advantage of Elizabeth Rethberg replacing Roman. 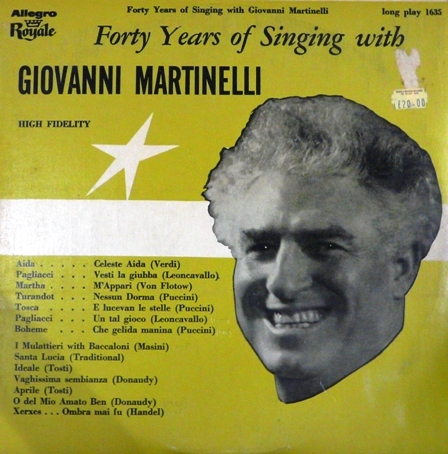 Martinelli is also in fresher voice then. 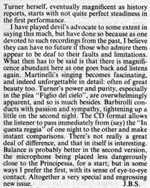 A review of this performance in the Gramophone magazine by Alan Blyth is shown on the right: I quote, 'The perfectly focussed tone, long breath, sustained line and impassioned but unexaggerated emotion of his reading remain unsurpassed....and listen just to the cry of "Miseria mia" in Act II - it's emotionally shattering...'. Martinelli talked of his assumption of the role of Otello: 'Otello was an opera which I had thought about and prepared for for many years. 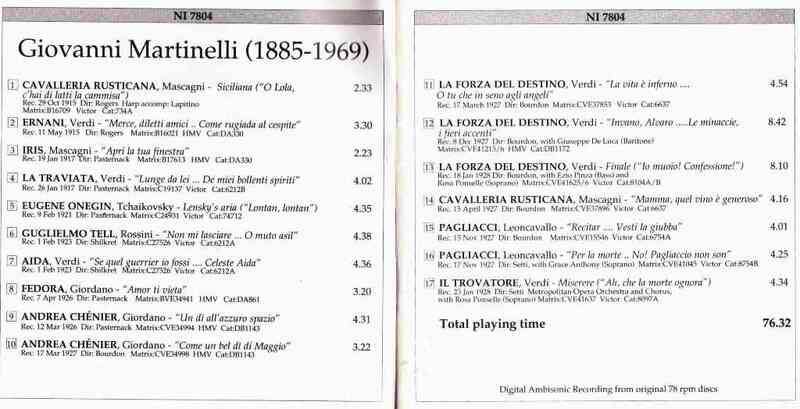 I had discussed the character of Otello with Arrigo Boito as far back as 1916 after I had heard Zanatello sing the part. In 1912 I had also heard Franz sing the role in London. I finally decided I could sing the opera after I had got thtrough Respighi's La Campana Sommersa at the Metropolitan. The terrific strain of dramatic declamation and repeated high notes had not hurt my voice and I now felt I should begin a serious study of Otello. I was then 45 years of age. I sang part of the second act that season of 1930 at a Sunday night concert with Giuseppe Danise. 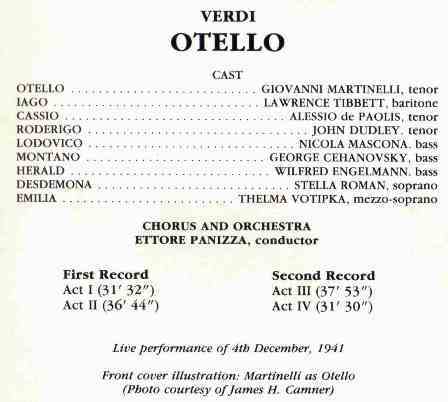 Years before I had also been over Otello's part carefully with Victor Maurel, who had created Iago at the initial performance under Verdi's direction. I then went to Toscanini and asked for his help. Toscanini also had participated in the initial performance as a cellist in the orchestra. "I, frankly, was frightened. The intensity of the declamation could ruin my voice and despite the glory and grandeur which I hoped to achieve, I could arrive with nothing. I loved my lyrico-spinto reportoire - especially the Lucias, the Lakmes and the Bohemes and the Fausts which I had been singing. Would Otello compensate if I had to give these up? I wondered - and proceeded to absorb the score slowly. Toscanini pointed out to me that for every three pages of dramatic declamation in the score there were seven pages which were lyric and that by emphasis on accent and diction I could, with the dramatic intensity of the text, convey the impression of a dramatic voice. I did not have the power of a Tamagno or the baritone qualities of a Zanatello. I was still a spinto and as a spinto I had to sing. Otello's opening war cry is the most difficult bit of declamation in the score. Far back on the stage one must thunder forth the phrases of Esultate! L'orgoglio musulmano sepolto e in mar, nostra e del ciel e gloria! Dopo l'armi lo vinse l'uragano. Just 40 seconds of singing topped by a high B. It was some entrance - but then the long and beautiful love duet with the phrase - Gia nella notte densa - had to have a lyric line and a sustained legato. In the middle of this duet come the words Tuoini la guerra - thundering of war - this must be dramatic - but it should be uttered as a dramatic phrase and not sung in a manner to distort or destroy the line. The second act is also lyric - even Ora e per sempre addio. Only the recitative - Tu? Indietro! Fuggi! - M'hai legato alla croce! - dramatic but that drama is conveyed in words. However, when Si pel ciel arrives one must summon voice and give with all the power at one's command or be drawfed by the baritone and the floods of orchestration Verdi loosened at this point. Dio! mi potevi scagliar - is also expressed in a half-choked, half-demented voice, as the almost suffocated Otello says Dio! m potevi - scagliar - tutti i mali - della miseria - della vorogna etc. Only two-thirds through the aria does Otello begin to give more than half voice and he virtually chokes with his final B flat. His asides on his throne are also lyric utterances and only occassionally does he give vent to an animalistic scream which is not a beautiful sound but is expressive of his agony, as for instance, Anima mia, ti maledico. His farewell, the glory of his life gone, is sung in a style more reminiscent of a parlando with an occassional lyric flash as the exhausted and beaten man prepares for his own death - Nium mi tema etc., and his final words Un altro bacio are a whisper as he dies. Otello can be exhausting from a vocal standpoint, but the union of the fabulous power of Verdi with the magnificent text of Boito can exhaust a man just in speaking the part, let alone singing it. 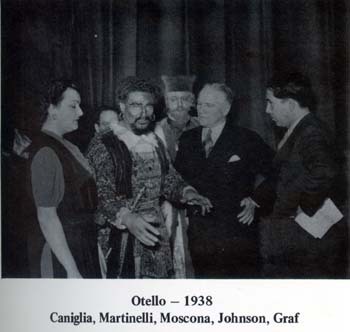 I first sang Otello in 1936 in San Francisco at 51 years of age. Then in the spring of 1937, I had the honour of singing the part in London during the Coronation season and then in December of 1937, at the Metropolitan. 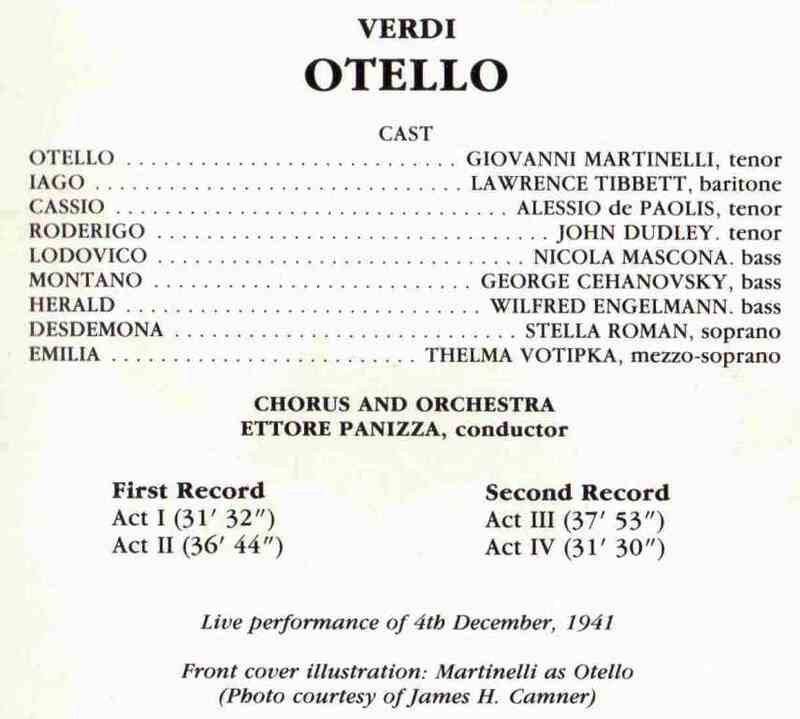 My final Otello was in 1947 in Philadelphia, when I was 62 years of age." 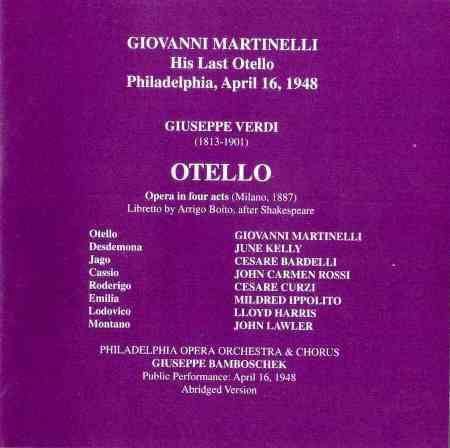 That last Otello performance from April 16th, 1948 in Philadephia is also available on CD, Grammofono AB 78 935/36 although it is an abridged version with June Kelly as Desdemona and Cesare Bardelli as Iago and conducted by Giuseppe Bamboschek. The details for that recording are shown below. 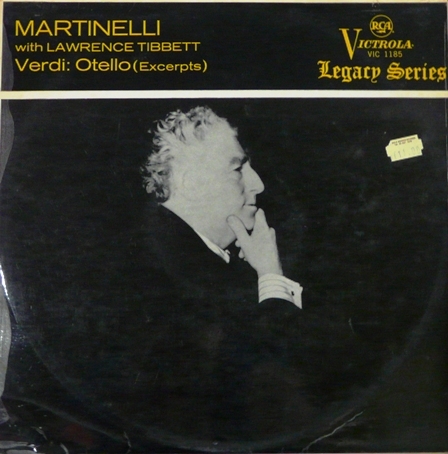 There are reportedly two more Martinelli Otellos available, a 1940 recording with Rethberg and Tibbett and a 1938 recording with Caniglia and Tibbett. John Steane writes about the former performance in his book, The Grand Tradition: 'The best of the complete recordings from the stage is that taken on 24th February 1940. 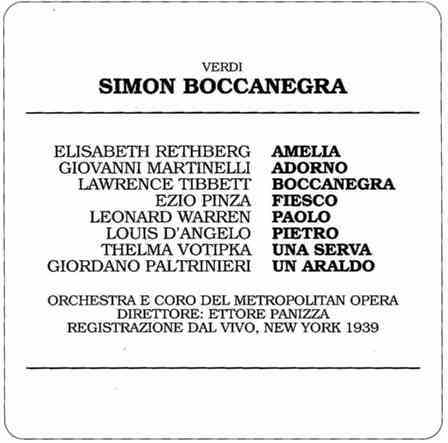 Rethberg is recognisably 'the worlds greatest soprano' again here, and Tibbett is the excellent Iago. Panizza conducts with decision and flexibility, at a fantastically fast allegro in the first scene, very much school-of-Toscanini in drive and intensity, but allowing a relaxation of tempo and more room for the expression of tenderness than in Toscanini's recording. 'Esultate' and 'Abbasso le spade' command attention by the tense, knife edge cleaness, and an essential chafing in Otello is caught as the blood begins to rebel. The love duet draws it lines in long, smooth curves, retracts to a pianissimo that expresses this inheld emotion in which there is the tension of fear for the future ('I do fear my soul hath her content so absolute....'). Martinelli is specific in his grasp of that particular phrase in the Italian, the pathos of its irony made implicit in his tone; and this is typical, for from Iago's first insinuations we are to see the suffering Otello as in some kind of X-ray of the nerves, the neurosis of unsure power, remaining aristocratic and commanding however the weakness and anguish are exposed. It would take a separate essay to comment analytically, but every phrase calls forth its own colouring and distinction, from the lurking sadness in 'Quel canto mi conquide' to the fury and loathing of 'quella vil cortigiana che e sposa d'Otello'. 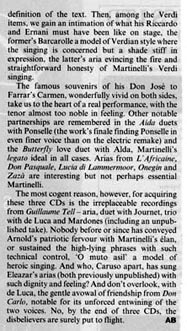 An excellent review of Martinelli's Otello can be found in John Steane's book, Voices, Singers and Critics. 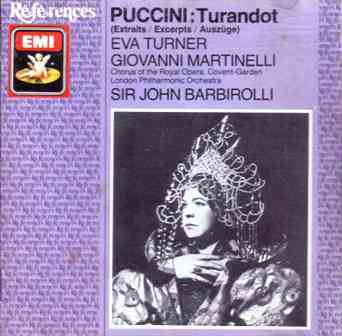 One of the most legendary performances of Martinelli's career was his performance of Turandot given during the Queens Coronation year of 1937. 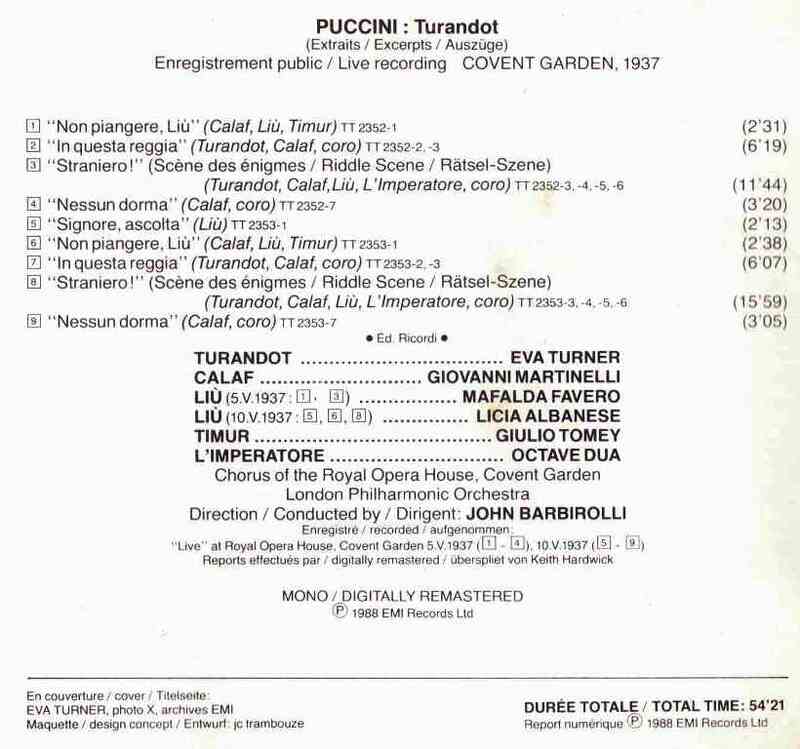 The performance seemed to be the subject of various contractual arguments which delayed its release, but fortunately the extracts are now available on a CD, (EMI CDH761074 2), albeit only as tantalizing extracts. 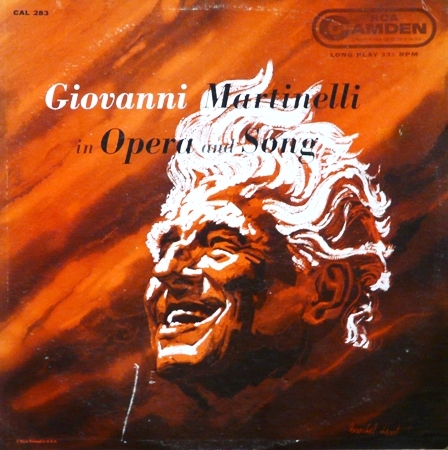 To quote the sleeve notes of Richard Bebb, 'With John Barbirolli at his magical best in the pit, and two of the greatest voices of this century singing with total commitment and a white-hot intensity of expression, these recording are, without doubt, among the most valuable that the gramophone has preserved for us.' You can also read, on the left, a review of this CD by John Steane, from the Gramophone magazine. The track listing is shown below, (click on the image for a larger version). 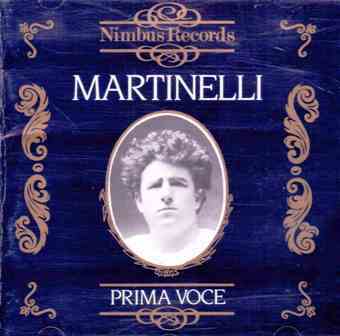 I think the best introduction to Martinelli is the Nimbus CD from their Prima Voce collection, NI7804. It includes extracts from all his earlier operas, Ernani, Guglielmo Tell, Aida, Andrea Chenier, La Forza del Destino and Pagliacci. 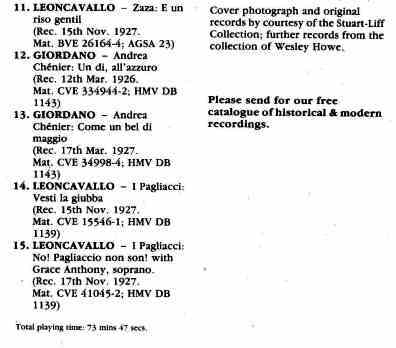 The recordings are made between 1915 and 1928. The track listing is shown below, (click on the image top bring up a larger version). 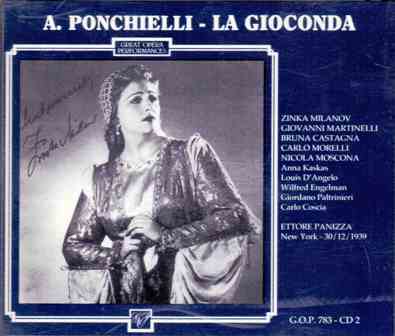 The above CD also makes mention of a recording of Aida made in 1943 with Milanov and Bruna Castagna. 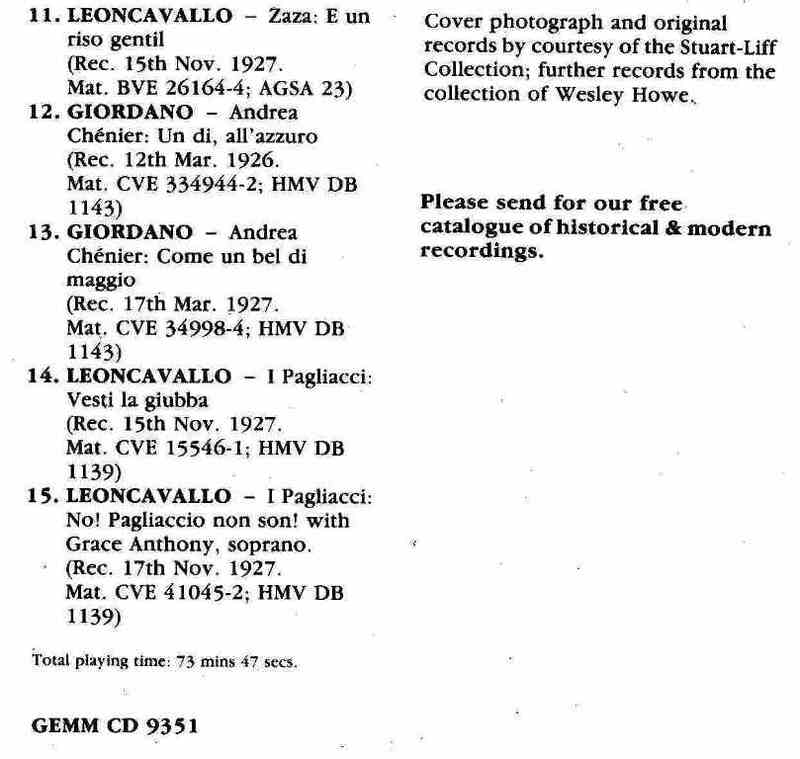 The track listing for this recording is shown below, (click on the image for a larger version). 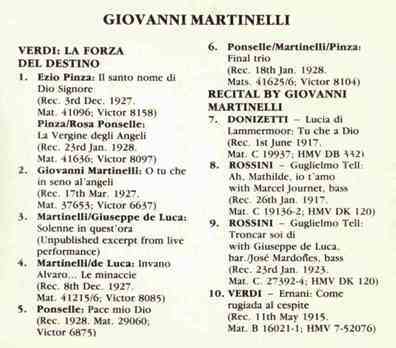 'The recordings from La Forza del Destino show clearly the emotional power of Martinelli's singing. 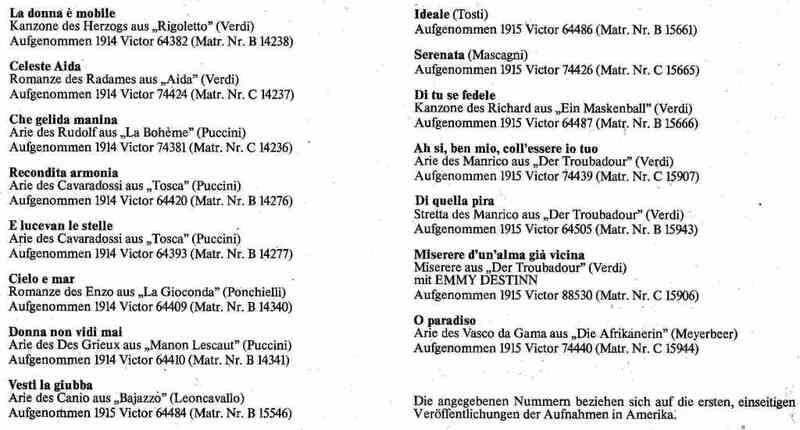 In the recitative and aria Ó tu che in seno degli angeli' , not only is the phrasing uniquely broad and imaginative, but there is a sense of suffering and yearning conveyed with am aristocracy of style devoid of indulgence and self-pity. Then in the duet from Act 4, after 'bowing' the legato phrases so beautifully, he turns in the final outburst', (Ah segnasti la tua sorte'), with a glottal attack and open vowel sound on the high A, stung at last beyond endurance by the taunts of his former friend.'' John Steane. The following is the track list for the above LP (RCA Camden, CDN 5105) together with their source and the year of recording, (this is additional information I have added, I can't guarantee the correctness of this information). 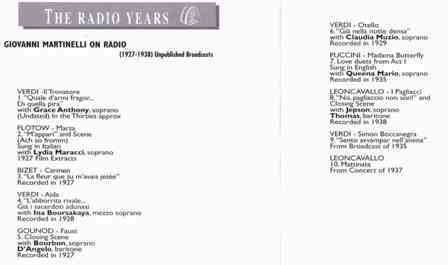 Band 1: Verdi, Il Trovatore: Mal Reggendo with Louise Homer (1928, DB1215 2-0554271 [A41605]). Band 2: Verdi, Il Trovatore: Di Quella Pira (1915, 7-52077 [A15943]). Band 3: Verdi, Il Trovatore: Miserere with Emmy Destinn (1915 DB333 2-054063 [A15906]). 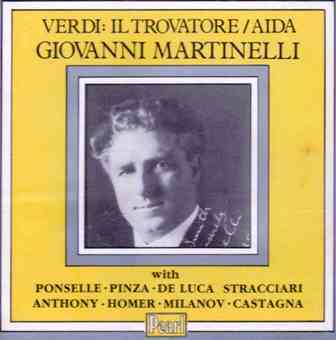 Band 4: Verdi Il Trovatore: Ai nostri monti with Louise Homer (1928, DB1215 2-055427o [A41606]). Band 5: Verdi, Un Ballo in Maschera: Di tu se fedele (1915, DA523 7-52066 [A15666]). Band 6: Gounod, Faust: Salut demeure (1918, DB334 2-032053 [A21429]). Band 7: Roxas, O Ben Tornato Amore (1918, DA523 7-52141 [A21428]). 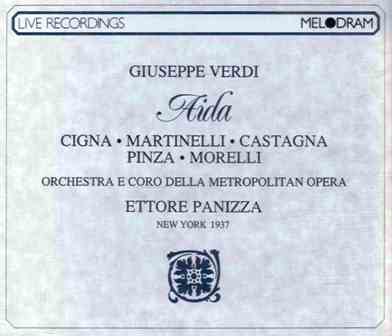 Band 1: Verdi Aida: Celeste Aida (1926, DB979 2-052314 [A14237]). Band 2: Verdi, Aida: Mortal Diletto ai Numi with Ezio Pinza (? or Anthony), Nume Custode e vindice (1927, A41076). 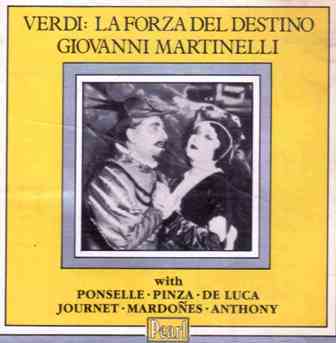 Band 3: Verdi, Aida: La Fatal Pietra with Rosa Ponselle (1926, DA810 7-54043 [A35459]). 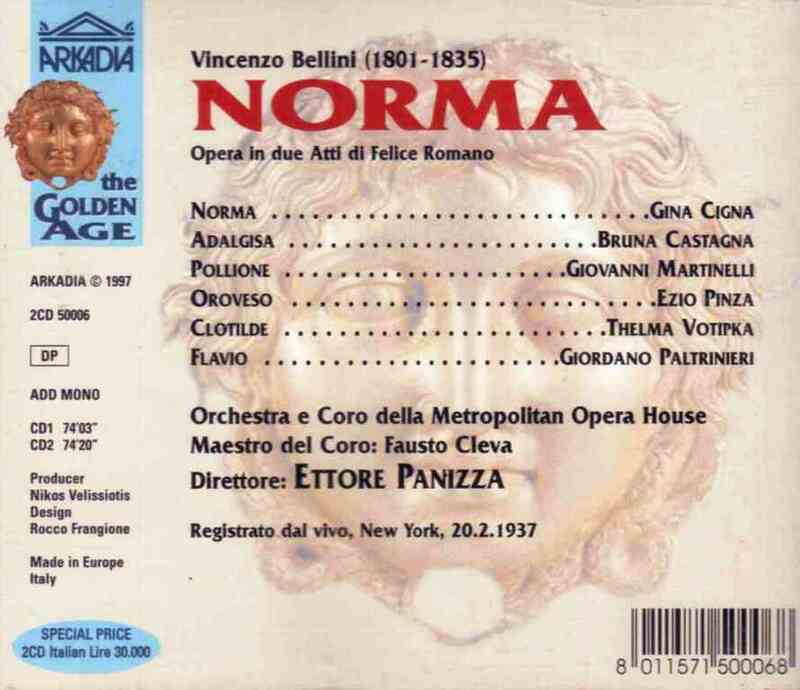 Band 3: Verdi, Aida: Morir si pura e bella (1926, DA810 7-54044 [A35460]). 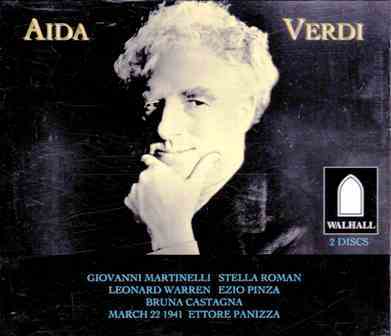 Band 3: Verdi, Aida: O Terra addio Pt.1 (1926, DA809 7-54045 [A35461]). 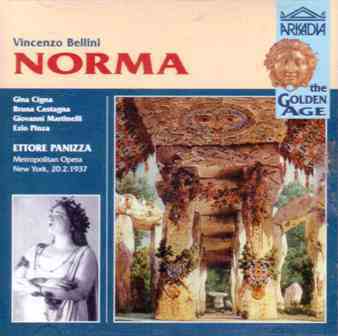 Band 3: Verdi, Aida: O Terra addio Pt.2 (1926, DA809 7-54046 [A35462]). 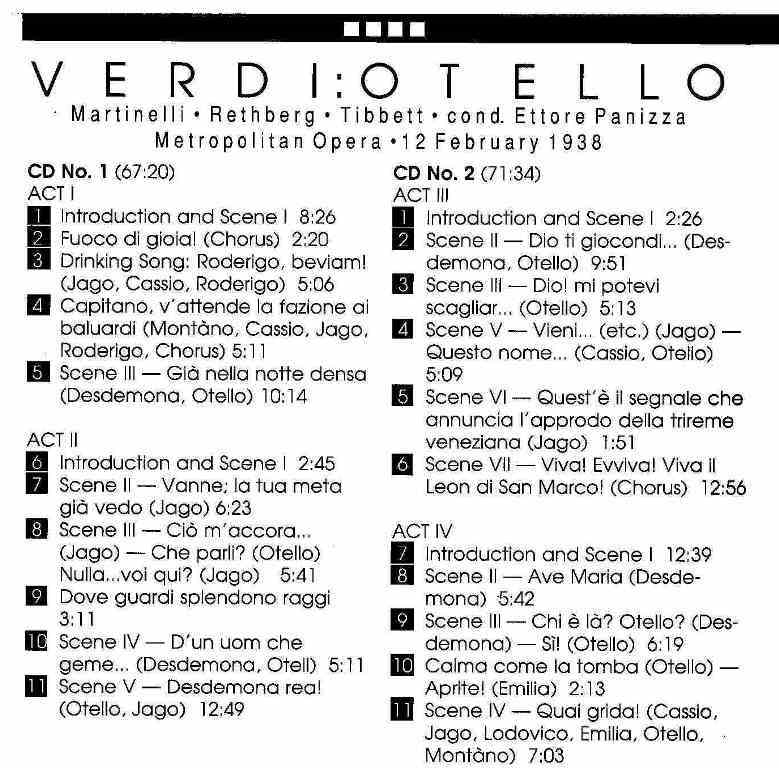 The sleeve notes by Richard Bebb and Edward J. Smith include an extract from a lecture, 'The Singing of Verdi', Martinelli gave in London at the Royal Institution (1962 I believe). "Trovatore was the opera in which I felt closest to Verdi. I guess I have sung at least 250 performances of Manrico. I sang the opera for the first time in Monte Carlo in 1912. 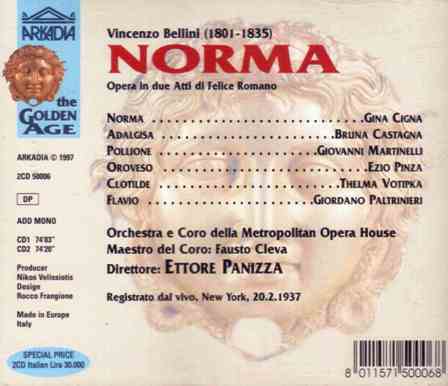 It was a good performance, but it was in 1914 that I really began to know what Verdi had written into this opera. Trovatore had been out of the repertoire of the Metropolitan for seven seasons. Toscanini, who had worked hard on the opera with Verdi, was determined to show a Trovatore as Verdi would have wanted it. The result was a veritable revolution in thought on the opera. The first rehearsals for Trovatore were called in October of 1914. We had a minimum of fifty rehearsals of two hours or more duration for each... Our cast included Emmy Detinn, Marguerite Ober, Pasquale Amato and Leon Rothier, as well as myself... Toscanini allowed me the interpolated B flat at the end of Deserto sulla terra and also in Ah! si ben mio. 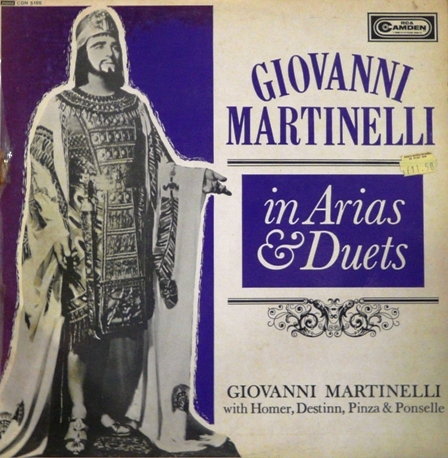 The first aria was made into a minstrels serenade establishing the character of Manrico from the outset, but the warrior in the young man was best exemplified by the concluding high note. 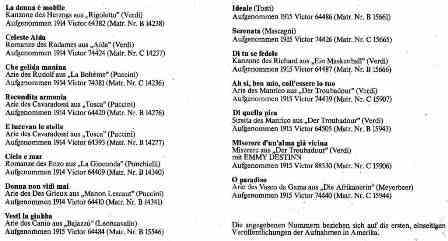 Toscanini pointed out that the two verses were identical, and for this reason the B flat was allowed even by Verdi. ...To me Verdi was King. He was my Emporer of Opera, and I was but a disciple gifted by Almighty God with the power to interpret the King of Music's message to the world. That is my epitaph, and no man could have a prouder one." 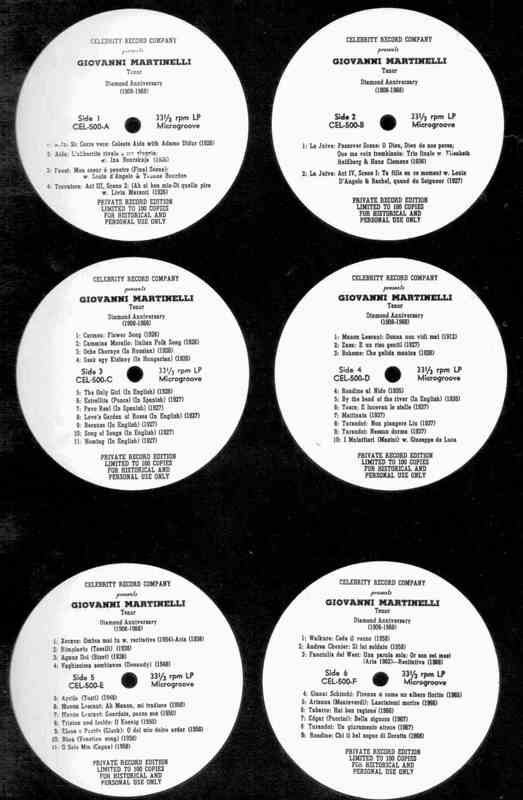 The track listing is shown on the LP cover, above. This LP is from Allegro Royale, No. 1635 (1955). This boxed set of 3 LPs is commented as 'Private record edition. Limited to 100 copies for historical and personal use only. It is issued by the Celebrity Record Company, CEL-500 A/B/C/D/E/F. It comes with a booklet with extensive notes by Edward J Smith (see Biography). 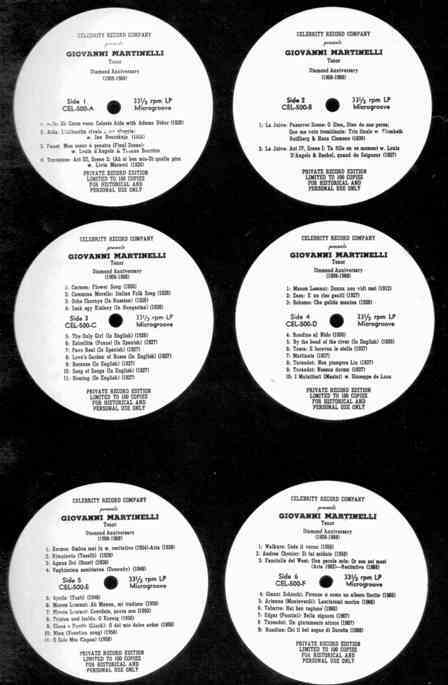 The track listing for this LP is shown below, (click on the image to bring up a larger version). 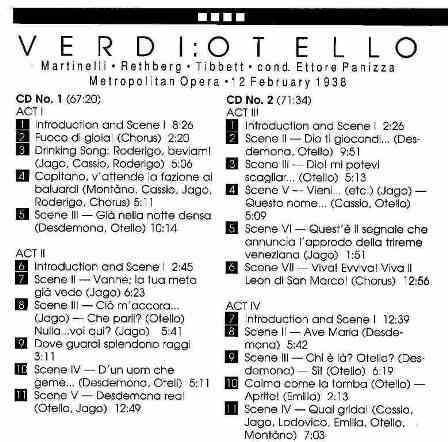 1: Verdi, Otello. Dio! Mi potevi scagliar (5/9/1939). 2. 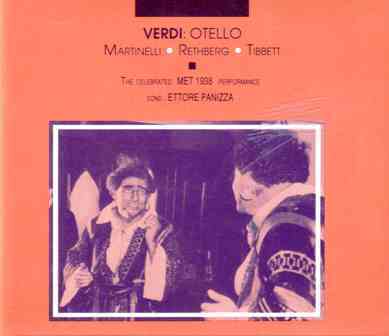 Verdi, Otello. Nium mi tema (5/9/1939). 3. Halevy, La Juive. O Dieu Dieu de nos peres si trahison ou perfide (12/24/1928). 4. Bizet, Carmen. Air de la Fleur (5/11/1915). 5. Gounod, Faust. Salut, Demeure (1/25/1918). 1. Verdi, Ernani. Come rugiada al cespite (5/11/1915). 2. A de-Leva - Fernando Tanara. Nina (6/22/1925). 4. Bizet. Ouvre ton coeur (3/28/1916). 5. Tosti. L'ultima canzone (1/19/1917). 8. Jules Granier. Hosanna (4/7/1926). The track listing is shown below. (Click on the image for a larger version). 2. Gia nella notte densa (Love duet) [Giovanni Martinelli, Helen Jepson]. 4. Ora e per sempre [Giovanni Martinelli, Lawrence Tibbett]. 1. Oh! Monstruosa colpa! [Giovanni Martinelli, Lawrence Tibbett]. 2. Dio! Mi potevi Scagliar. [Giovanni Martinelli, Lawrence Tibbett]. 4. Piangea Cantando (Willow song) - Ave Maria [ Helen Jepson]. 5. 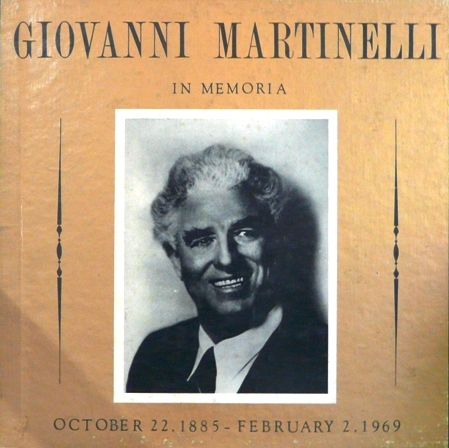 Nium mi tema (Death of Otello) [Giovanni Martinelli]. 'Apart from the opening Esultate the basic essentials to the role are here. 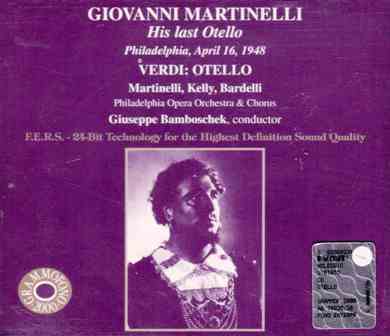 That Martinelli would have sung a thrilling account of Otello's entrance is amply born out by his thrilling delivery of Ora e per sempre addio and the declamatory fevour he brings to Si Pel Ciel. The voice here has a bronze-like brilliance and sheen but is scaled down to exquisite raptness in the Love Duet. The Death Scene, Nium mi tema, has the inner despair of finality but perhaps the highlight and emotional core of Martinelli's assumption is his heart rending account of the third act monologue, Dio, mi potevi scagliar, in which he lays bear the grief-stricken agony of a soul in ruins. So masterly and all embracing a performance leaves leaves one with only one regret - that it was not recorded complete.' Delcie Howard.